Last week I had the distinct honor of being included in the #140You conference in NYC. A few months ago, I got a call from my mother. She told me that a conference on Health, Wellness, Fitness & Food was being organized. She encouraged me to get involved. My first reaction was the familiar pull-back I feel whenever I’m intimidated. Then she told me about the host. His name is Jeff Pulver. Jeff is probably best known as the co-founder of Vonage. His professional resume will make your head spin. But that’s not what caught my attention. What grabbed me was this: Jeff and I have been strangers on parallel paths. We both went too many decades without minding our fitness. Then, within months of each other, we both reached a tipping point and found the motivation to turn it all around. We both had to start our fitness journeys slowly, because slowly was all we could manage. We both set lofty goals. We both knew it would be hard work, and we did it anyway. No gimmicks. No surgery. Just discipline, sweat and time. I had never met the man, but I was sure I had discovered my fitness soul-brother. I submitted my story and this blog, and was invited to attend. So, despite shaking like a leaf (on the inside, at least) I left the kids with my baby daddy and stepped out into a whole new adventure. Not only did I find a community of positive and inspiring individuals, I gained a whole new understanding of the meaning of fitness. My new friends addressed everything from paying attention to where our agriculture comes from to self-esteem and meditation. We talked yoga, gluten-free eating, body image, the importance of cooking your own food, and so much more. I will be writing about these themes at length in the weeks to come, but first I had to share my greatest revelation: Just because I finally got fit doesn’t mean there isn’t plenty of room for improvement. There is a whole lot going on in the ‘wellness’ department that I have not even begun to consider. When I was obese, I blamed my weight for everything from my lack of self-esteem to my joint pain and everything in between. Losing weight and gaining strength improved lots of things in lots of ways. But it wasn’t a cure-all. I still battle my demons every day. I still struggle with self-esteem. I still worry about my health. When an alcoholic quits drinking, a lot of things improve in a lot of ways. The body is stronger and healthier, the mind is clearer, life gets perceptibly better. But quitting drinking can’t take away the reasons why you were drinking in the first place. It doesn’t mean you’ll never fall off the wagon. It’s a life-long process that requires daily tending. Sobriety (like a healthy and fit lifestyle) should not be taken for granted. #140You delivered a powerful reminder that all that is required for positive change is our own will to do what it takes to achieve it. Even if it doesn’t come naturally. Even if it hurts. Fitness tangibly improved my daily life. But I am not at my end goal. I don’t even know what an end goal would look like! What if I am capable of levels of physical and spiritual wellness that I always assumed were somehow impossible for ‘someone like me’? After all, less than 2 years ago I had never even considered the possibility that I could be a physically strong woman. What if I apply as much positive energy to adopting new wellness practices as I did to losing 100 lbs? What if those new practices made as much of a difference as discovering my stronger, more confident self? I confess – I’m feeling a bit giddy about the possibility of once-unimagined improvements manifesting in my life. To this end, there is currently in my kitchen: Fish oil, probiotics, a whooooole lot of vitamins and herbs, avocados, almonds, blueberries, grapefruit, edamame, chia seeds and green tea. 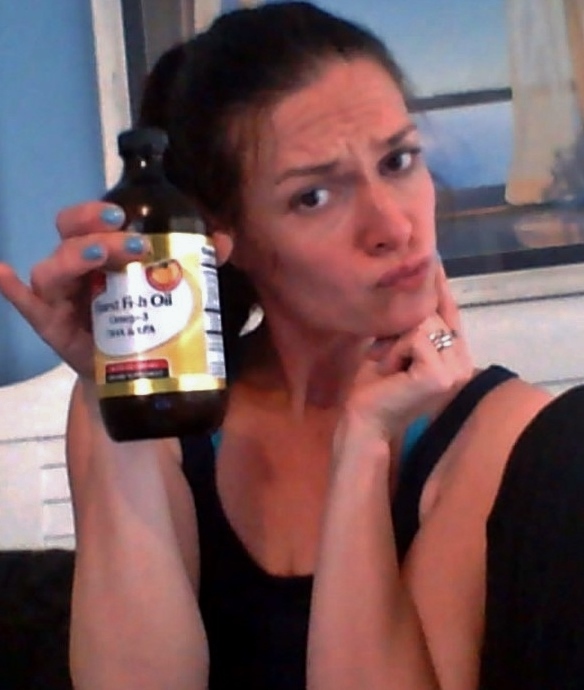 Will my body thank me if I hold my nose and choke down fish oil? Keep pushing your boundaries, friends. Who knows how far we can go! Sidebar/Update: I have gone 2 weeks without stepping on the scale! I’m hanging in there, but I worry about it more than I want to. I’m doing a bit more cardio than usual, because without confirmation that I’m maintaining, I become convinced that I’m gaining. Stupid, toxic scale mentality! Hoping I’ll shake it as time rolls on. Nice work Katey! I enjoy your blog – when did you become such a terrific writer? *blush* Thank you, dear friend. Glad to be a part of the #140You club with you! Let me know if I can answer any of your farm/ag/dairy questions! I’m so glad you keep coming back! How are things going on your journey? Is the scale still being a stubborn beeyotch? It was great getting to know you at 140 you! You have a great spirit! I wrote about my personal health journey too…. you can check it out at http://janiceperson.com/food/my-personal-health-journey/ I’m going to publish some of my photos this next week or so!